Preheat oven to 180°C. Line 2 oven trays with baking paper. Place the flour, almond meal, icing sugar and butter in the bowl of a food processor and process until mixture resembles fine breadcrumbs. Add the egg and milk and process until just combined. Gently knead until mixture just comes together. Shape into a disc and cover with plastic wrap. Place in the fridge for 30 minutes to rest. Roll out dough on a lightly floured surface to a 3mm-thick disc. 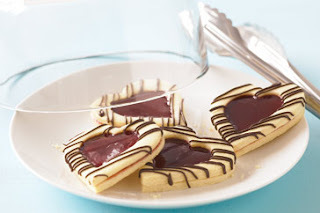 Use a 7cm-diameter heart-shaped pastry cutter to cut out 32 shapes from the pastry. Place on the lined trays. Use a 4cm-diameter heartshaped pastry cutter to cut out shapes from half the hearts. Place on the lined trays. Bake in preheated oven, swapping trays halfway though cooking, for 8-10 minutes or until light golden. Remove from oven and set aside on trays to cool. Place the chocolate in a medium heatproof bowl over a saucepan of simmering water (make sure the bowl doesn't touch the water). Stir occasionally with a metal spoon until the chocolate is completely melted and is smooth. Place the melted chocolate in a small plastic bag. Use scissors to snip the end. Drizzle chocolate over the heart rounds. Set aside for 15 minutes to set. Combine the jam and water in a small saucepan over medium heat and cook, stirring, for 5 minutes or until jam melts and is smooth. Remove from heat and strain through a fine sieve into a heatproof bowl. Discard seeds. Use a small pallete knife to spread a little of the jam over a large heart biscuit. Top with a chocolate-drizzled heart. Continue with remaining biscuits. Use a teaspoon to spoon the remaining hot jam into the centre of each heart. Set aside for 30 minutes to set. Store in an airtight container. Variation: We've used the classic combination of raspberry jam and dark chocolate in this recipe, but you can try experimenting with different jams and chocolates to suit your taste: try strawberry jam with white chocolate or apricot jam drizzled with milk chocolate. You can also experiment with the shape of the cookie cutter you use, such as stars, flowers or rounds.